Some people love the rugged demeanor conveyed by their Jeep Grand Cherokee, but others want to protect its look and give the vehicle a little bit of enhanced styling. 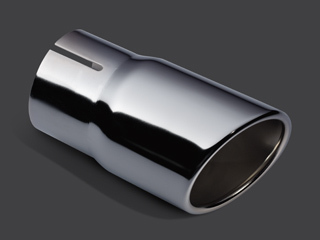 The Chrome Exhaust Tip 82212400 available at JustforJeeps.com can do just that. It will put a sleeker, and sportier, face on the exhaust system you already have on your four-wheel-drive. Installation of the Chrome Exhaust Tip from Mopar is a snap, so your Jeep will be looking sharper in minutes flat. 3" in, 3.5" out, cut tip with clamp, chrome. Exhaust tip will only fit on base exhaust stems and will not fit SRT8, Trackhawk, Summit, or any other model that comes with a chrome exhaust tip from the factory. The chrome exhaust tip gives my Jeep a classy look. It's a great accent! ProsFits like a glove. Sturdy bracket that comes with it . Purchased this for my 2018 Grand Cherokee Laredo. Nice heavy gauge metal and great chrome finish. Also like the heavy duty clamp that comes with it. Quick install. Very pleased with this purchase. Easy install on my 2012 GC Laredo. Adds a nice finished look. Fit 2015 Grand Cherokee perfectly, installed in 5 minutes, provides great look.